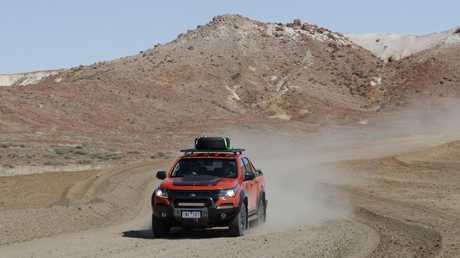 The Holden Colorado Z71 Xtreme can tackle some of the toughest terrain in the country. POWDER-fine desert dust traces a cross-wind contrail as the convoy of Holden Colorados exits Coober Pedy for Oodnadatta. 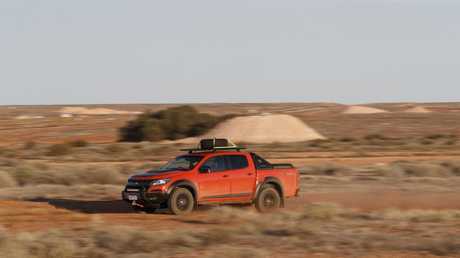 We're evaluating Holden's workhorse utes in conditions they were designed to dominate, from low-speed running over rough, rutted tracks to triple-digit pace on unrelentingly long gravel highways. Either way, it's a constant test of how well screwed together the suspension, door-seals and panels are. 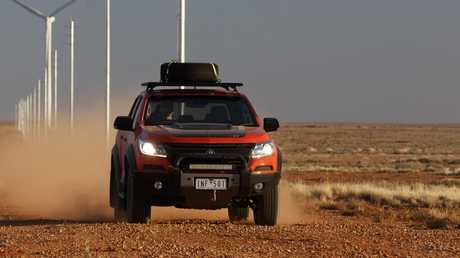 The Colorado convoy is travelling the scenic but mechanically challenging route from the hobbit-like underground community of Cooper Pedy to the Painted Desert and then on to Oodnadatta, self-proclaimed as Australia's driest, hottest spot. It didn't disappoint. Part of the trip included the famous Oodnadatta Track and the Colorado is in its element on the corrugated gravel trails that constitute most of the trek. Local know-how: The Xtreme benefits from local suspension tuning. The torture test makes you appreciate what a limited slip diff can do. Combined with the stability control software, it ensures the Colorado tracks true even as we surf across humps of rounded rocks from one set of tyre ruts to another. It's the sort of local set-up that once made Commodores and Falcons the preferred sedans for those living in the bush and still gives Holden a point of difference as engineers convert seat-of-the-pants experience into algorithms tailored to Australian conditions. The Colorado's steering is also up there with the best. The feel is reasonable, the weight about right and the lock-to-lock turns are a good compromise for a vehicle that has to deal with city streets and outback tracks. Smooth ride: the Xtreme wasn’t skittish across potholed gravel roads. The suspension doesn't feel jittery over the endless ruts, despite the fact we're only carrying a spare tyre in the tray. The overall impression reflects the Colorado's mid-pack status. 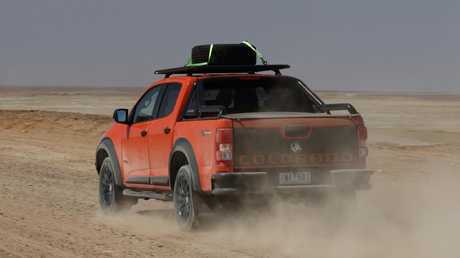 It's a satisfying drive but doesn't look as sharp outside as a Ford Ranger or as refined inside as a VW Amarok. And this segment is increasingly dependent on looks and features to lure new buyers. Brand new cars are a rarity out here: vehicles are bought for their reputation and price and then worked hard. Consequently we're seeing plenty of older Toyotas and Nissans pass by among a scattering of Holdens and Fords. 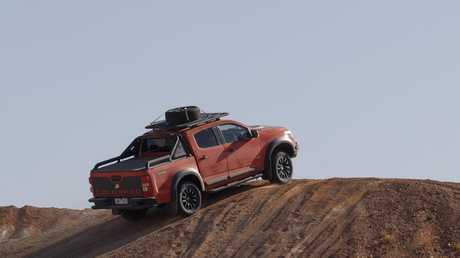 Occasionally, new four-wheel-drive utes and SUVs manage to escape the suburban estates and shopping centre carparks and venture into their natural environment. They're then typically driven by miners and mechanics moving at the highest practical pace, or grey nomads packing big loads and bigger caravans. Load-lugger: The Xtreme has a 4500kg load-rated winch hidden beneath the licence plate. 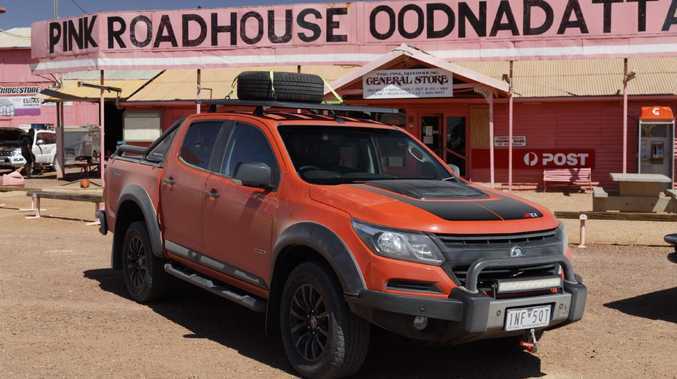 It's the perfect location, then, to show off Holden's toughest Colorado to date, the Z71 Xtreme. The basics remain the same - a better-than-average 2.8-litre four-cylinder diesel turbo with decent driving manners on bitumen and in the bush and up to 3500kg towing capacity. The headline act for the upmarket workhorse is a 4500kg load-rated winch hidden beneath the licence plate. The winch is an aftermarket Warn unit and is integrated into a metal front bumper with underbody bash plate without affecting any of the Colorado's safety credentials. Stiffer front springs ensure the ride height and handling is the same as a regular Colorado despite the extra 65kg over the front axle. Mountain climber: The Z71 Xtreme wears big all-terrain tyres for extra grip. The weight of the winch and steel front bumper can be felt when dropping in to depressions at a decent clip but there's a skid plate to catch the gravel rash before the engine does. Other off-road additions include a LED light bar, 18-inch all-terrain tyres, plastic wheel arch flares, a tow pack and vehicle recovery kit. Decals, a roof rack, soft tonneau cover, extended sports bar, rear steel step, tubular side steps and a bonnet bulge complete the look. And the look isn't cheap - at $69,990 driveaway the Z71 Xtreme is priced around the likes of the Toyota HiLux Rugged X and Ford Ranger Wildtrak with the 2.0-litre twin-turbo diesel engine. The Xtreme hits dealerships in October as an automatic four-door ute with a $10,000 price premium and about $19,000 in extra gear. Not all Holden dealers will have the Xtreme, largely because their technicians will be the ones assembling the accessories to build the vehicle. Some couldn't justify it but Holden's product chief Andre Scott says about 120 dealers have committed. The Holden Colorado Z71 Xtreme lands in showrooms in October.